Started daubing some paint on the first of 32 units for my FW Dwarf army. The colour scheme is one that runs through all my dwarf miniatures and will be familiar to those who saw the grymn figures from earlier in the year. I always struggle to paint units, its the monotony of it, and i always try to spend too long painting individual figures. Even though i know the steel toe cap on third warrior from the left wont be seen when they are ranked up, I still seem to end up giving it 5 coats of paint. So I am trying to be dedicated and paint in a simpler style. I do all my painting in Foundry Paints, but this is the first set of figures I have used the new Citadel Washes on. Awesome! I love the old Grenadier Fantasy Warriors models. I have maybe f of the dwarves. I think they mix very well with Vendel Miniatures dwarves. I'm really struggling with my dwarf color scheme. The blue looks good. Yikes! Sold out? I hope they're going to make more. Maybe you can find some in stock at other distributors. 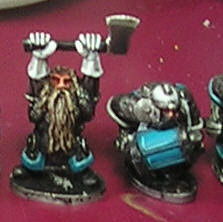 Yes, I plan on photographing a comparison of the Vendel dwarves with the Grenadier. I just need to flock the bases.